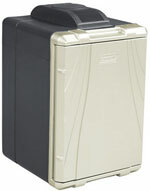 We have a series of quality 12-volt travel coolers from Koolatron, RoadPro, Coleman, and Igloo. 12 Volt Coolers are just the ticket for that weekend road trip or camping. In a hurry? We recommend the 40 quart igloo or Coleman coolers for Faster Delivery. We also have RoadPro's cooler-warmers and of course the high quality Koolatron coolers which are ideal for tailgaters, truckers, RVers or just packing up the car with sandwiches and drinks-for the family outing. 12 Volt coolers are lightweight and portable that you can take 'em anywhere, --inside the Vehicle, at picnic sites, hotels, office, etc. These coolers can be plugged directly into a 12 volt cigarette lighter outlet or can be used at home with an optional 110 Volt AC Adapter. Ready for tougher adventures? 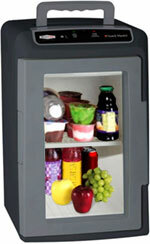 See Koolatron's Large Portable Coolers! Need something better? See Koolatron's Temperature Precision Controlled Coolers or step up to an Engel 12 Volt Fridge Freezer for best of the best. Lightweight and compact 12-Volt Cooler Warmer has a Twin Cup/Drink Holder on Side of Unit for your convenience. Keep your items cool while on the road and store the cord neatly when the unit is not in use. Great for limited spaces like cars and minivans. RoadPro's 12-Volt Soft Sided Cooler Bag is a 2-tone Elegant looking cooler that is large enough for 24 12oz cans, yet still light weight and easy to carry over the shoulder with an adjustable over-the-shoulder strap. Once in the vehicle, just plug it into the vehicle's cigarette lighter to continue to keep contents chilled. The 12 Volt SnackMaster plugs directly into your cigarette lighter socket and has a removable shelf which you can use as a wine cooler. This compact unit features sealed hinged lid with a thermal pane window and carrying handle.